Adam: Jason, it is my pleasure for you to participate in this interview and I appreciate what you do. Jason Sparks: It is pretty cool to be able to connect like this. In my mind I see a really cool interview taking place between Will Farrell and Jack Black in wing-back chairs next to crackling fire. That image is a bit funny, because I'm not really sure where it comes from. I think we would be better suited to be sitting stream side to a small brook with a 270 in our hands ready for action at the end of this. Let's work off of that one. Adam: I really like your forum. I personally enjoy participating there. You drive it with questions and it’s open and the conversation is loose. As with social media, there is the human element in differences of opinions but from what I’ve read, there is very little aggravation. The forum has a great feel, there is a respect for diversity and I appreciate that. You are the spark that got it started and keeps that going. You also keep the ship going in the right direction. I also like it that there is a wide variety of vendors contributing. Your forum is welcoming to all and that is important. As we get deeper into the subject of tenkara, I want you to remember, I value your openness and your perspective on tenkara. The “ten colors” of tenkara are essential to remember when having the conversation on the growth and the history. The broad spectrum of this fun form of fly fishing is truly served by your forum. Jason Sparks: That seems like so long ago. I just had to look up what the date was that this group started, which was October 8th, 2012. There were some independent forums out there like Tenkara USA's forum and your Tenkara-Fisher forum and just a few groups on Facebook. At the time, the Tenkara USA group called “Tenkara Anglers” was the most popular and most active. That group was already having a global reach on social media. There was a few localized groups out there too, mostly tied into state areas. I wasn't really sure what I was doing or how best to approach it on day one. I took a regional approach and started the group originally as “Southern Appalachian Tenkara Anglers”. 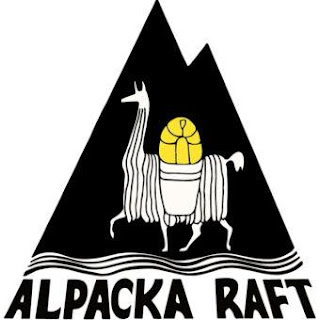 It was a bit of a rip-off maybe to latch onto the coat tails of “Tenkara Anglers” group name and simply add to it. I maybe should have been more original, but I wasn't. Mea culpa Daniel. At the time, I saw it as a bit of a subset to the TUSA group. I took the regional approach so the entire Southeast could play together and interact. About 2 years into it I could see that the member list far exceeded the Southeast region, it had gone a bit global also. The “Southern” was dropped as we grew into the “Appalachian Tenkara Anglers” group. Maybe it is akin to a baby moving from crawling around faster and faster to finally just standing upright an walking. By the time this renaming happened, the online group was pretty established as a “community” in my eyes. Adam: It’s always interesting to me how people got into tenkara, especially outside of Japan. In America, there are as many ways as people found tenkara as there is tenkara anglers. Jason Sparks: Pizza. I discovered tenkara waiting for a pizza in Black Mountain, NC. I was out on a day trip of adventure with my family one day. We had driven from Boone, NC over to Black Mountain about an hour away. We looked around that old hardware store on the corner that has been there for a hundred years. We looked at soaps, candles, birdhouses and expensive art in the shops spread around the central “old town” city blocks. When every one was good and hungry we stopped in the local brick oven pizza house. Sitting at the table I was turning pages in the regional “Blue Ridge Outdoors” adventure rag. There was an article titled “Unreel fly fishing” that caught my eye. About three paragraphs into it I realized this was something that I had never heard of before. I started the article over and paid attention to every word. I read it several times. This was something that I needed to know more about. That is the moment I found tenkara. What my family remembers of the day was the visit to Tractor Supply Co. down the street after that pizza. There they had just put out the Spring load of baby chicks for sale. There were hundreds of soft fuzzy “chirpers” in pale yellow and whites. They begged and begged for those baby chicks. That didn't happen. Tenkara did. Adam: In 2009, I was making bamboo fly rods when I got my first tenkara rod. Needless to say, I already was fly fishing for longer than the person was alive that introduced me to it! That was a little bit difficult to fathom, but I’ve learned many things in my life from young people. Before tenkara was exported out of Japan, I had already been conversing with Yoshikazu Fujioka for many years. He wrote very little about tenkara back then, maybe a rare mention. Nothing like he does now with his extensive Japanese kebari study. Yoshikazu is primarily a fly fisherman and that is what his web site started as back in the 90’s. After I transitioned to fishing tenkara as the only way for myself to approach a mountain stream, I began collecting old Japanese books and traveled to Japan to find out more about it. On my first trip, I was guided around by a Japanese fly fisherman. Here I am in Japan, an experienced fly fisherman wanting to learn tenkara, and it’s a Japanese fly fisherman that is introducing me to Japanese tenkara experts. Tenkara is something that is very small in relation to the whole of fly fishing there. Truly, it’s the way that I see tenkara here in America. It’s growing but it’s still small in relation to the whole of fly fishing. Back then and even now, tenkara has always been a little confusing to me because of the nature which it exists and how the information is typically disseminated. Jason Sparks: Tie on a kebari, cast the fly, catch a fish. Tenkara is easy. What more is there to understand anyway? In the context of the question “... easy to understand when I started?”, I think that answer is yes. In it's simplest form and definition, fixed line fly fishing made sense to me. I quickly saw the benefits the rod system added and I saw the variables it eliminated from other types of fishing. That is a short answer. I've been fishing for more than four decades. The first ten years of that was introductory and novice in practice. I knew how scour the dark wet grass for night crawlers and skewer them on a 1/0 bait holder hook. I grew out of my Zebco 202 green plastic push-button spin-caster to a spinning rod in my teens. At that time I adopted a mindset to start using artificial baits and lures. I think this was the first conscious challenge I made for myself in my angling. Could I continue to catch fish by “tricking” them to bite a piece of plastic? I went into ultra light spin gear and found that level of touch was so much fun. That started my intermediate phase that was nearly the next two decades. I really didn't grow very much in my angling knowledge or skill set during this time. Towards the end of that period I started dropping treble hooks from my lures and running them with one single hook. That allowed me to fish some North Carolina waters that are designated as “single hook artificial only”. It was another step toward increasing my knowledge and experience to be a better angler. With all of that said after my short answer, I'd like to say that the fixed line rod system has increased my angling knowledge in just a few years much more than the first decades did. That is where the “easy to understand” in the question takes on many deeper layers on insight and explanation. Since the day I found tenkara, I have begun to study angling, gear application, presentation techniques, approach angles, and much more in very different ways. My willingness to learn from tenkara has made me a vastly better angler. Tenkara was my introduction to fly fishing. Adam: Recently, I’ve been including a little reading by a broader audience of tenkara authors outside of Japan. Particularly, “Discover Tenkara” and the information that is co-presented with their Japanese peers. Paul Gaskell is an experienced fly fisherman and I see this as an attribute and relevant to the conversation on tenkara. I enjoy a fly fisher’s presentation of tenkara. I believe an experienced fly fisherman, with the help of Japanese experts is an attribute of tenkara. Many of the best tenkara anglers in and outside of Japan also do fly fishing. Their expertise in the greater scope of fly fishing and the focus on Japanese tenkara is advantageous to the story of tenkara within the broader community of fly fishing. 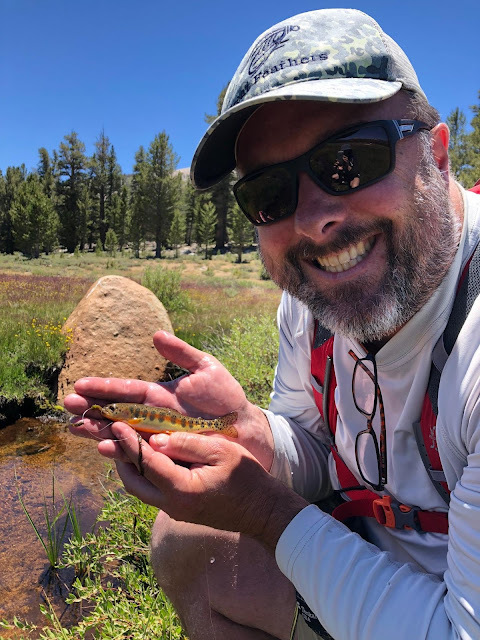 Jason Sparks: I know most of the readers understand the words of “fly fishing” and “tenkara” that we are using are to differentiate between the two styles. For the readers that may be newly introduced to tenkara, I want to let them know that we both agree that “tenkara” is “fly-fishing”. The word choice we are using is to distinguish between conventional western style rod & reel fly fishing and fixed line fly fishing practices. To the question, I understand what you are saying here Adam. I have blurry lines around this topic. If I were looking to learn a strict discipline of historical and traditional tenkara, then finding an instructor deeply schooled in this practice would be ideal. That set of lessons though would need to set with strict discipline to the origins of the style and the practical application of it. Quite frankly, I'm not sure that exists, or is needed. The Japanese with the greatest knowledge are sharing valuable information with all us that are new to tenkara, and by that I mean those of us that are in it over the previous ten years. I suspect that many of them are familiar with and have fly fishing knowledge. Has that influenced or bled over into the tenkara lessons that have been shared? Let me take a step back and clarify that. I'm not making any assertions to any of the shared knowledge. Not at all. I'm not saying that they are pure teachings and I'm not saying it it blended with other influences. Let me ask a question here. If you learned pure unadulterated tenkara teachings, would you apply it as such on the water, without blending other angling knowledge? I don't. When I am fishing I am sure that I blend the lessons I have read or been taught about tenkara with things I have discovered for myself. I am sure that I blend trout tactics with bass tactics. I am sure that I blend moving water techniques with still water ones. I think my point is that I have a toolbox of tactics. When fishing, there is a primary focus on the tools selection I have made, but undoubtedly it is influenced by the breadth of knowledge that I have, whatever that may actually be. Let me choose some different words to express what I shared in the previous question. I am a better angler because I have learned some tenkara methods. I am a better tenkara angler because I know many other styles of fishing. All my angling knowledge fits into “my toolbox” and I call on it every time I hit the water. So the relationship between fly fishing and tenkara might be about applied comprehension. The more you know about fishing in general, fish behavior, lure selection, lure presentation, reading water, etc. makes you a better angler. The two styles of angling are not dependent to each other. You can do one and not the other. What I have chosen to do gather knowledge across the board and apply it smartly where it is best suited. Adam: In my old and new Japanese tenkara books, quite a few include western fly fishing within their pages. I believe the two forms are closer together than they are farther apart and in my view, they perfectly co-exist together inside of Japan and I want to promote this outside of Japan. I don’t believe you should sell your fly rod to get into tenkara. Get into tenkara to use it where it works. Bring the two together, I don’t want to contribute to a divide. The two should coexist because they belong in the same family, tools in the same tool box. On their own, the Japanese have been doing both since the beginning of tenkara as a sport. Marketing tenkara can be like politics. It can bring people together or it can divide them. Perhaps you understand what I’m trying to get across, fly fishing and tenkara are brothers in the same family. At the time of the writing of this interview, I do not know if you are a fly fisherman. That is neither a plus or a minus for me, but it will be interesting to understand your perspective either way on how the two are in relationship to each other. Jason Sparks: I don't understand it quite frankly. I sort of have two groups divided in my head around fly fishermen, or more appropriately said, fly-fishing anglers. One would be every day recreational fly casters and the other would be the business/industry side of it. I'm not sure I understand why recreational anglers would get their neck hairs up over a different method of catching fish. I have talked with many people that haven excellent bass catching skills and they don't seem to mind fixed line angling. There have been crappie specialists here in the South that have no interest in coming to fisticuffs over fishing method differences. I don't suppose a “fly fisherman” ever went ape over those swimmers itching to stick their forearm into a 30lb catfish mouth. Do fly fishermen bang on “noodlers”? I don't understand it. I don't feel like they should any insecurity around it or any fear of threat. It isn't like tenkara anglers are trying to take over the world. The business side of it also baffles me. For the most part, there are very few things a real business should have strong objections too. Child labor, intellectual property theft, and global/local corporate citizenship concerns are ones I can understand. I can't see any scenario where a fishing style or type of fishing rod is one of them. For fishing industry businesses, gill nets I get. Long-lines in protected waters I get. Dolphin slaughters, yeah that too. But why would a business take such offended positions as some of the fishing industry and small private fly shops have? It doesn't make any business sense to me at all. 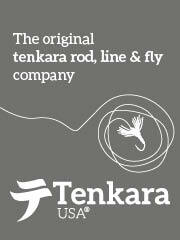 There are small fly fishing shops and outfitters that even carry tenkara rods and accessories as product. Many make no effort to learn the style or the tactics. Many can't speak intelligently about tenkara or even open and rig the rod safely. I'm surely not suggesting that all fly shops are like that, but we all have stepped into ones that are. It just makes no sense to me. Adam: As I read more and more on current tenkara perspectives, I see a lot of division. I feel bad about it but people tend to gather together with those of the same opinion. Politics is an example of this divisiveness, the way people gather, divide and the rhetoric that goes along with that. I don’t even want to go into tenkara politics or contribute to that divide. We go fishing to escape that yet when we gather in social media, we are not fishing, we are gathering and conversing about our subject. I think your forum and particularly you are good for the sport. You are bringing many new people into tenkara and I appreciate it. Jason Sparks: I didn't realize that it has been six years now. That is a pretty long time. Why do I keep messing with it? That is a good question. More than once I've looked at the membership to see if there was a good set of hands, or several, that I could pass the reigns off too. The truth is that the forums takes from me and gives back to me. If it were monetized in some way, I may have people interested in taking it over. As it is, it is a community that I lead, but “we” built one by one. I have a vested interest in seeing it survive and grow in some smart fashion. 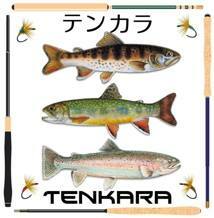 There are three large tenkara groups on facebook. I don't compare Appalachian Tenkara Anglers to them in any way. Number of members isn't my measure. This group has been modeled to be an interactive community of welcoming and sharing people. I don't have anything to sell. Every week we have new faces arrive and ask a first question. It is the open arms that the returning answers come from that really makes me smile. I see people answering questions now that only six or nine months ago were asking the same questions. We have very experienced tenkara anglers chiming in to help answer stuff. Knowing that this group is accepted as a central place to “gather” online across brands and definitions of tenkara and fixed line angling, I really like that. That is why I continue to do it. Adam: I think that Japanese tenkara has a story that must be included in the conversation on our subject, it’s where we came from and it is honorable to understand our history and where it was developed. In my own interview with Masami Sakakibara and also reading interview with Yoshiyuki Mushu in the Discover Tenkara book, I am understanding a common idea that once tenkara has left Japan, it is open to interpretation and discussion however, the Japanese history and form should be included in the conversation along the way. I find that honorable to where tenkara. In my case necessary from day one and to this day, I separate Japanese tenkara and everything else outside of Japan. When I use my tenkara rod for Rio Grande Cichlids or Sunfish in warm water, I use the hashtag #untenkara when writing about or describing it on social media. If I am conversing with people online, I do not point out what their tenkara is or isn’t, what they do is their fishing, I do mine. I tell the story of tenkara passively. I know what tenkara is. Jason, I understand you are open to different styles of flys and presentation on our subject, tenkara fishing and my words are in no way a critique nor am I trying to throw shade on you. I respect you and your work and I enjoy your contribution to tenkara and I think you are bringing more people to the sport than you are creating a divide with people that have a singular view. Jason Sparks: This is an interesting question and I've thought about it more than a few times. I am sure that my position on this has changed a bit over the last few years. I wonder what other perspectives people have looked at it from. Let me step out on a limb for a second. Have you ever wondered about the origins of using fiddler crabs to catch sheepshead against the pylons of a pier? Have you researched the birth of molded plastic baits for largemouth bass? Was having a deep understanding of sea run striped bass necessary to chase them when they swam miles up the Connecticut rivers? How about... hey, there are many more examples. Note that was to the proverbial “you” by the way. If you have done anything of the sort, was “origins” knowledge necessary for you to be able to fish that way? All the times I fished those ways I didn't really care about origins of or the story behind it. I just went fishing. Why does “tenkara” have to be treated differently? With that pointed out, I'd like to say that for me, it is different. It has been important for me to learn about it from an inquisitive scholar perspective. I don't proclaim to be the most educated on the tenkara story. I do however know enough to satisfy me for right now. When I want to know more, I'll go find my own answers. I think it is very important that the authentic tenkara storylines are available online and on social media platforms. I'd like to think that all tenkara anglers would be interested in that. It is clear that many are not. I like that the information is available and I like to direct people to it. However, I'm not the tenkara police and don't feel like chasing anyone down that may be “doing it wrong” by someone else's interpretations. Adam: You do more than the forum. I’ve seen some reporting on gatherings. I’m not playing dumb, I just don’t follow everything you do so I ask the questions here to understand and bring to light what you do. Jason Sparks: I seem to recall that one of the first things that ever got planned was a fishing trip to some amazing back-country water in the Blue Ridge Mountains near Boone, NC. I planned it, promoted and invited people to it. The local tenkara guide, Bob Ivins and I were ready to show off some local waters. One person came. The three of us tackled the water and had a great day together. It was a success. Why? Because it was the first one, with bigger better things to follow. There was an idea that came about to create a tenkara event that included merchandise as well as educational presentations. The first one came together in Foscoe, NC after a few conversations with Bob Ivins and Lance Milks. As the event was coming together, I was working on branding for it. As a friendly gathering of vendors and anglers, sharing a room for learning, wiggling rods and telling fish stories, along with catered Carolina BBQ and some time on the water together, it was clear it was going to need a name. Late one night, “Tenkara Jamboree” popped into my head. We have had four different “Tenkara Jam” events here on the East coast. I am very proud of those events. There has also been several tenkara camp outs planned and executed. We did an event at Smokemont Campground in the Great Smoky Mountain National Park in October a few years ago. In October of this year we just has the “Tenkara Campout: Davidson River” in the Pisgah National Forest just outside of Brevard, NC. The in-person get togethers are really nice. I've also tried a handful of interactive events in the Appalachian Tenkara Anglers group. We have held kebari/fly swaps. We have had round robin swaps, where you send a dozen of the same fly to someone and receive a dozen of the same fly from someone else. I also include a “tie or buy” clause in the kebari/fly swaps. This means that buying a dozen gets you in the same way as if you had tied them. The effort is to include as many people as possible. There has been several “kebari material swaps”. This is where you join to send $10-$15 of spare materials you have in your goodie box to someone else. And receive $10-$15 of spare materials from someone else. The idea is that you get exposed to new tying materials without having to spring for it yourself. That concept seemed pretty original and I haven't seen it replicated anywhere yet. The idea actually came from something you did Adam. When I was just getting into tying flies you sent over a care package of feathers, hooks and items. That inspired the material swap where others could participate in something similar. For the previous fours years, I was presenting a “Tenkara 101” class for the North Carolina Wildlife Resource Commission at the Pisgah Center for Wildlife Education. There were usually six sessions through the warmer months. The program covered tenkara basics to include; history, rods, lines, flies and tactics. I hope this picks up again next year. I'm always considering ideas to continue and start up in an effort to keep the tenkara momentum moving forward, growing and expanding. Adam: When I started tenkara, I was all about being a rank beginner. Even as an accomplished (advanced) fly fisherman, I wanted to learn tenkara from a day one perspective. 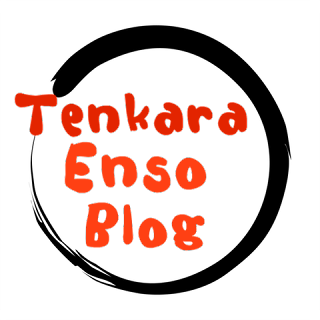 I started a forum, it grew but people did not learn about tenkara as I did and my perspective is mine. I don’t expect people to know what I know, especially if they aren’t studying the things as I study. As I traveled to Japan and fished with many different tenkara experts in many different mountains and their streams. What I learned was not what I was reading in social media. I didn’t force my understanding of it preferring to just report what I knew. I see your forum as a portal. There are experts there and there are a lot of beginners too. I like to see the mixing of experiences, I think this is where you see a lot of growth. Jason Sparks: It has been pretty much on the same path of growth since it was started. It is very important to me that the group is inclusive. That the group is tolerant. That the group is welcoming. The interactive and dynamic nature of the membership is special. Every week we get brand new members. We do have some very experienced tenkara anglers in the group. The model that has been crafted by my efforts, but driven by the members, is that of mentoring. Every week beginner questions get answered with respect. Valued experience is shared by a veteran angler. Short of Zuckerberg pinging me to let me know that ATA just won the facebook global recognition award that carries a $1MM check with it, I just want it to continue being what it is; a smart and caring place for like minded anglers to share time and knowledge. Adam: I’ll be honest, as much as I enjoy the social aspect of online tenkara discussion, I also want to escape it. Typically, I go alone on long journeys up to twelve hours drive time and sometimes I get on a plane, alone and follow my dreams about it. Lately, I’ve had a friend or two to share my adventures with. I have a friend in particular share almost all of my trips. He also is a fly fisherman learning tenkara and I don’t force anything on him. He has access to my library, really isn’t interested so much in that kind of study and his tenkara is excellent. He does cross some flys as I do but that’s about it. We leap frog each other onstream and we stop for onigiri and some sake or whiskey. I cherish the time we spend together, he is a family man too and we escape like a couple of kids to our youth. Jason Sparks: Not necessarily by design, but I fish alone nine out of ten times. Mostly because I don't plan out many fishing days in advance and it often is a moment of opportunity. I love spending time in the waters with people at Tenkara Jam, and the tenkara camp outs. That is nice to watch others “do” as a learning experience. I love to share that. A bigger truth may be that I like fishing alone. Being alone on the water, operating at my speed in my waters is where I find myself. Have you seen the movie with Kevin Costner when he is a baseball player about to pitch a perfect game? Not “Field of Dreams”. It is the other one, “For Love of the Game”. There is a scene in there when this perfect game is coming together for him. The fans in New York are heckling him, the pressure of the situation is mounting. I mean “a perfect game” in baseball is a big deal. The camera dials in on Costner's face and you hear his voice say “Clear The Mechanism” as the sound falls to silence and the entire stadium of activity goes into a blur. The only thing in focus is the pitcher and the batter. At that point he is dialed in. That is me on the water. When I get three steps into the water, I have dozens and dozens of times said out loud those very words, “Clear The Mechanism”. My time fishing allows me to decompress. This is where I find myself. That cool water grabs the hardness of my day and flushes it downstream. The experiences I have on the water are mine. There is a savior in that. Adam: I read where you traveled to California and you went and caught your trout in Horseshoe Meadows, I’m going to do that too sometime soon. Jason Sparks: That was the single most impressionable day fishing I have ever had. I will never forget it. It almost didn't happen you know. 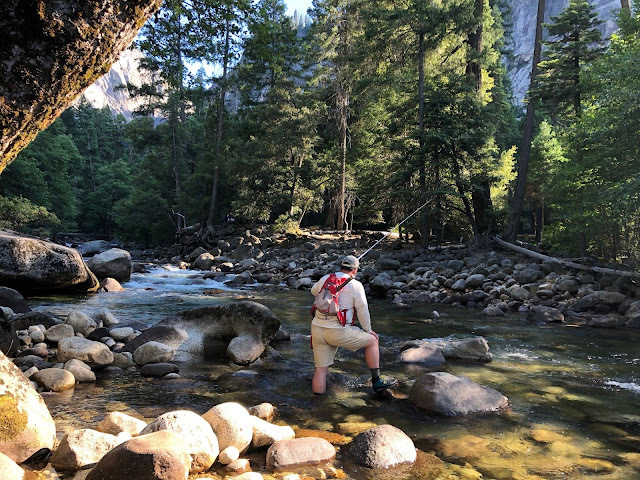 My three day California license had expired the night before after fishing Yosemite NP for a few days. At breakfast, I opted to pass on the morning of fishing and just drive out from Lone Pine into Death Valley early. My wife insisted! I had read about them, talked about them, planned for them, mapped them, and tied special kebari for them. She knew where my heart was. Praise her, she saved the day. This was the day that we drove up to 10,000 feet in the Sierra Nevada mountains and entered into the Golden Trout Wilderness. This place was magical. For an Appalachian angler, these were very different mountains. Once we left the parking lot we were both trudging through sandy soil with small bits of gravel in it. It was very much like walking on the beach. We pushed down the trail about half a mile and then turned left into the meadow. The short grasses were waving in the wind and seemingly pushing us toward the dark green ribbon meandering through Horseshoe Meadow. The creek in that meadow was some of the smallest water I have ever fished. It averaged about 12 inches deep and about 30 inches wide at most points. There were some bends that opened up a bit and there were some straightaways that were super tight. I had a new Nissin RS 270 rod I was breaking in on these fish. I got it rigged up and started casting quickly. Look, I was super excited and almost giddy. Within a few casts I had my first catch. At this point I was definitely giddy. 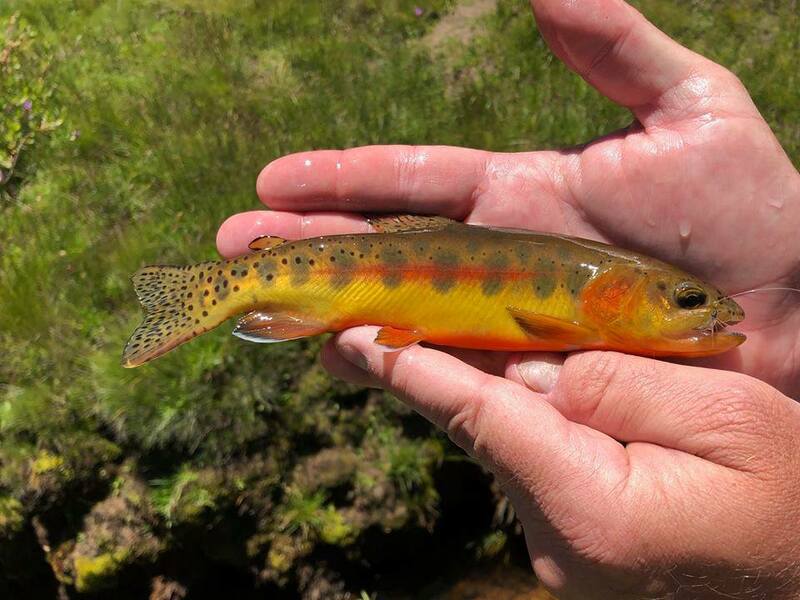 This was a high altitude Californian Golden Trout, native only to these mountains. It was the most beautiful fish I have ever caught. That is saying something since my comparison it to the Southern Appalachian brook trout, which is a Blue Ridge gem. This meadow offered no vertical cover at all. There was nothing to hide behind, with the exception being the bank itself. I found myself working back and forth across the side of the creek with a keen awareness to the undercut banks that the slow flow of water had made over the centuries. The little wild fish were very skittish. The wind was breezing and gusting the entire time. The midday sun was bright and the sky was an amazing blue. I worked that creek for three hours. In that time, I landed 39 golden trout. I could probably go on and on about the amazing day on the water. It was a pinnacle day. I’ve asked you some really tough questions, I know you are a good guy and I have come to understand a little about your background. Jason Sparks: In my day job, I work for a large bank in a global crimes group and investigate money laundering. Essentially this is looking at the source of funds, tracking movement of funds and assessing activity around those funds trying to determine if suspicious activity is present. Some scenarios present themselves in very obvious manners, some do not. It is important for me to collect information and frame a story that clearly explains illicit monies and the ways that it are being used. It may be more important that I can glean the right information that explains and justifies the activity for your neighbor. We don't want to get these reports wrong. Jason: I may be looking for a few tips here. How do you manage to keep your Tenkara-Fisher forum relevant? Adam: I stopped the Tenkara Fisher forum at the start of 2017 due to a malicious hacker planting a virus in our database. I have been making forums for twenty some odd years but keeping them relavant was never in the cards for for me. You see, I’ve had at least a couple of forums going on, somewhere since 95. Let me explain, I usually make a forum because I’m interested in something and want to learn more about it. When I have stopped learning, if the forum is interesting on it’s own then I just let it run it’s course. If I end up driving it trying to keep it relavant, then I know the life of it on it’s own is over and I move on either letting it die or transfering it to someone else. Relevant just was not in the thought process. Hackers have killed a couple of the forums too. That’s a war I’m not interested in fighting. The way the Hacker’s have fun is evil, screw that, not fun. So I stopped setting up forums on servers I had to pay for and let the big social media companies fight the hacker war. That is a big relief. I’m taking back my time. Your interview is a project I’m happy to get in the can. I’m not going to do this like I’ve done in the past. It’s all about my time and that is a precious thing. I’ll still go online and do the things I do, I’m just not going to waste time doing it. Absolutely NO REFLECTION on what you do, you are an individual, just as I am and you do what you do and I respect that as I’ve already said. Jason: We have seen several companies embrace “warm water tenkara” in the last few years. Badger Tenkara was one of the first to really push on small mouth bass as a target species. I remember having some talks with Daniel at Tenkara USA some years ago about addressing a wider group of anglers, such as warm water fishers. You spent some time working with them on the inside with them. What did you learn or experience about how a business looks at the direction of growth tenkara is making outside of Japan? Adam: I already had learned a lot about fly fishing ever before being introduce to tenkara by Daniel Galhardo. 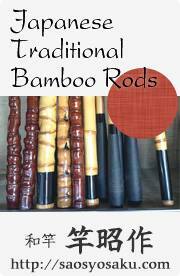 I was making bamboo fly rods at the time and my education in fly fishing was nearly complete. I just like doing it. I was fly fishing in the salt, making bamboo and then the housing market forced us to sell our home and no more shop. The timing was right, this focused form of Japanese stream fishing that was similar but better to what I was doing comes along and boom, I want to get good at this, learn all about it and sharpen that knife in my tool box. In learning, I became affiliated with Sakura and many of the experts in tenkara from Japan. I was doing this independantly from Daniel and Tenkara USA, sort of in parallel, same path but a little different. I’m happy the way I ran my own business, I helped people if they needed help, even if they were a competitor. When I was hired to work for Tenkara USA, I didn’t find out anything new about tenkara in Japan or the way they run their business. Tenkara USA has done an excellent job at spreading tenkara. The way they do it is their trade and their recipe. I was a professional tenkara angler for a while when I was working for them. As a professional, their secrets are safe with me. But the truth is, there are no secrets, just a bunch of nice guys and well, Margaret, she is cool. Jason: It looks like my interview is #39 to be posted to your site. That is an impressive catalog you have there. I am honored to be included in this group. I'm always inspired when I see so much strong positive energy being shared across the “tenkara world”. 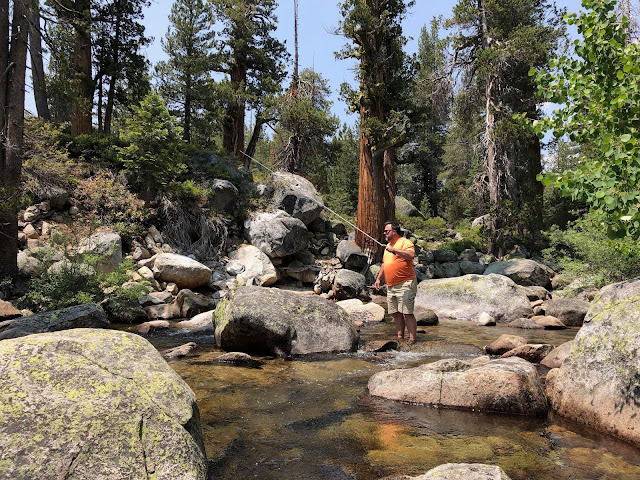 I suppose that mine being number #39 and that fact that I caught 39 golden trout on my bucket list day may be just a coincidence. But then again, maybe not. The “tenkara gods” may shine on me yet. Adam: I really appreciate who you are and what you do. Outstanding interview. See you at the Summit. Thank you! I’m grateful we were able to do this. I’m sorry I will not be attending the Summit this year. Maybe we can meet another time. Take care. Jason is a phenomenal ambassador for tenkara and an even better community builder and host at his in-person events. It's great to see his efforts highlighted here, as well as the opportunity to learn a little more about him as a person and angler.